DVD to iPhone Converter for Mac is specially designed for Mac users to convert all DVD files including DVD-Video, DVD IFO file and DVD folder to iPhone supported video and audio formats including MP4, M4V, M4A and AAC. DVD to iPhone Converter for Mac is very professional but easy-to-use DVD ripping software for Mac Operation System (including Mac OS X 10.5 leopard) users to rip their favourite DVD files to iPhone on Mac. In addition, this DVD to iPhone Converter for Mac has powerful video and audio editing functions including Trim, Crop, Snapshot, Settings and Merge. With DVD to iPhone Converter for Mac you can enjoy any DVD on your iPhone anytime and anywhere without any limitation. Notice: The trail version just permits you to experience some of the powerful functions. Only up to 10 seconds of each file can be converted and clip function is unavaiable. If you want to enjoy 100% features of this intelligent iPhone Ringtone Maker software, just $25.00, you can get a full one! Click button to cut any clip of the added DVD and convert it to iPhone on Mac. Click button to justify the video playing region to meet your needs. Click button to set video effect for the iPhone video and audio. For example, video brightness, video contrast and video saturation. Notice: The following step-by-step operation guide is just for Mac users. 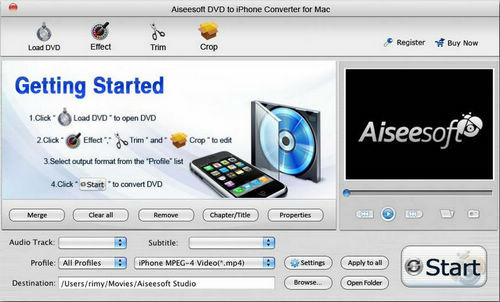 First of all, download a free trial version of DVD to iPhone Converter for Mac and install it. Double-click the program icon on your computer desktop and a user-friendly interface will pop up. Step 1: Click button and browse your computer to find the DVD movie you want to add from your hard disc or DVD-ROM, open your DVD folder, select the VIDEO_TS folder and click OK.
After adding your DVD movie, you can choose any titles or chapters you want to convert by clicking the check boxes before them. Step 2: Choose the output format for your iPhone from the Profile box. Step 3: Choose a folder in your computer to save the output file from Destination box. Step 4: Click the Settings button to set Video Encoder, Video Resolution, Video Frame Rate and Video Bitrate. You can also set Audio Encoder, Audio Sample Rate, Audio Channels and Audio Bitrate. If you want to merge the selected titles or chapters into one file, just check Merge into one file. Step 5: Just click button to start converting your DVD movie for iPhone on Mac. You can choose to shut down your computer or open the output folder after conversion so you don't have to sit before your computer waiting for the conversion work to finish.